Frost Science aims to make a difference in people’s lives by inspiring them to appreciate the impact that science and technology can have on every facet of our world. The museum will continue to inspire visitors in a new state-of-the-art facility designed by Grimshaw Architects currently under construction at Museum Park, in the heart of downtown Miami. The museum will be structured around a lushly landscaped indoor and outdoor Living Core Aquarium of terrestrial and aquatic environments, featuring a Gulf Stream aquarium experience totaling over 500,000 gallons of salt water. 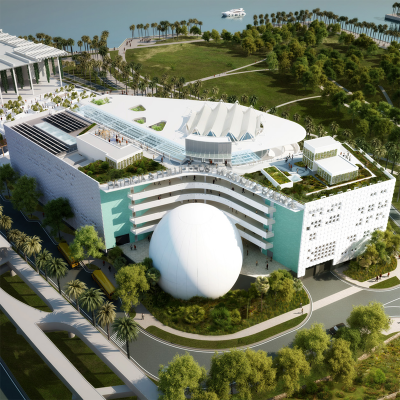 The facility will also feature the state-of-the-art full dome Frost Planetarium, the Knight Learning Center, Innovation Labs and Cafe, Baptist Health South Florida People and Science Gallery, and an Exploration Center featuring permanent interactive exhibits: Feathers to the Stars and The River of Grass.